When I was in culinary school in Toronto, I bought a beautiful bottle of rosewater, in order to make malabi for my food theory presentation on Israeli cuisine. I had never tasted rosewater before, and did not realize then how much I would come to love its delicate, perfumed flavour. However, the delicacy and soft elusiveness of its flavour are rather misleading, as rosewater is quite a powerful concoction. A teaspoon or so of it will go a long way. Thus the reason why my bottle, even after a year, hardly looks touched. 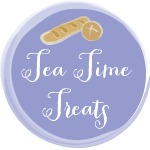 So I was delighted when Karen of Lavender and Lovage chose “edible flowers” as the theme for this month’s Tea Time Treats challenge. Any excuse to dip into my seemingly endless bottle of rosewater is gladly welcomed. Besides, June just seems to call for roses. Possibly because it is the month of weddings—my cousin was married this past weekend. 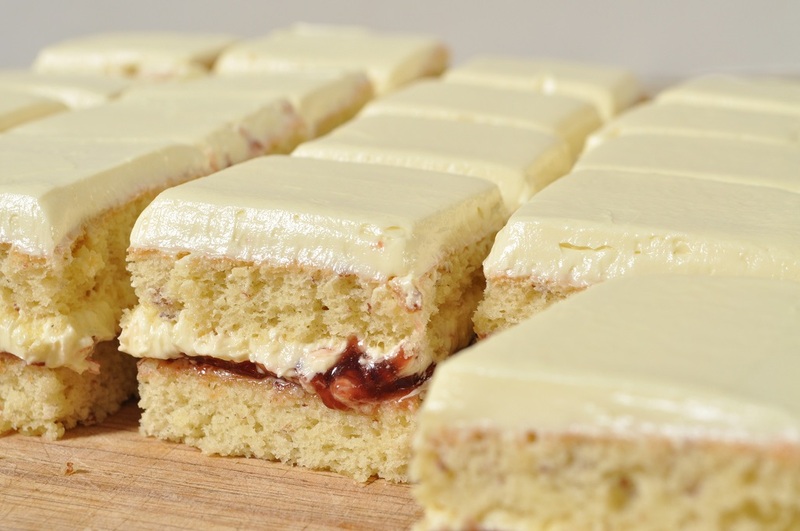 And perhaps that was why I felt irresistibly drawn to make a cake, or rather, many cakes: exquisite little petit fours of almond-rose sponge with raspberry jam filling (what is it that makes rose and raspberry such a sublime pair?) and satiny, pale ivory icing laced with another dash of rosewater. I used a particularly lush frosting: French egg yolk buttercream. You see, since numerous members of my family eat egg white omelets, we always end up with an extraordinary surplus of egg yolks. But as I try to keep my baking egg-free, due to my mother’s allergy, we generally end up discarding the yolks. I’ve always felt sorry about this waste, especially since we buy our eggs from the local Pennsylvania Dutch market and I know the hard-working people who raised them. It seems disrespectful to their labour to waste the yolks of the eggs. But there was no way I could use them up on a daily basis, and I had been taught in pastry school that egg yolks, unlike the whites, could not be frozen and stored for later use. But then I read that you could freeze leftover egg yolks, if you mixed one teaspoon of sugar per yolk in with them. So I added some sugar to one breakfast’s yolk surplus and stowed them away in the freezer. And it worked! 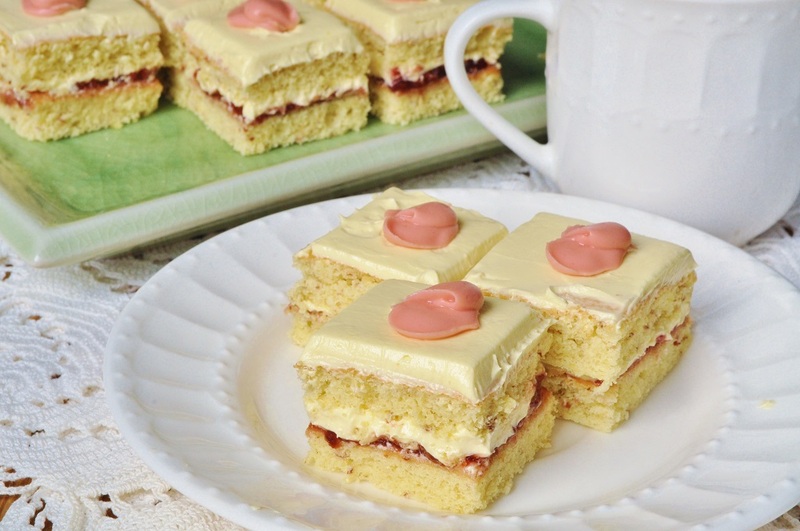 The yolks from the freezer whipped up into a smooth, light buttercream just as nicely as fresh ones. I can’t hope to keep up with all the leftover egg yolks in this house, but still, it’s nice to know that I can at least freeze some of them and give them a glorious end in lovely little cakes like these, rather than simply tossing them down the disposal! These petit fours are my submission to Tea Time Treats, the always lovely challenge run by Karen of Lavender and Lovage and Jane of The Hedgecombers. Karen is hosting this month, with the especially lovely theme of edible flowers. I am also submitting them to the Biscuit Barrel challenge over at I’d Much Rather Bake Than . . . Laura has graciously given us “Summer,” as our theme, thus allowing us to indulge whatever fancies our warm-weather moods demand. Mine leaned towards weddings, cakes, and roses. 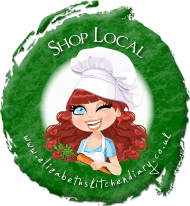 Also, since the buttercream on the petit fours allowed me to salvage some of my local egg yolks, I am linking up with both the Shop Local and No Waste Food Challenges headed by Elizabeth of Elizabeth’s Kitchen Diary. No Waste is being hosted this month by Michelle of Utterly Scrummy Food for Families. And finally, it is also my contribution to this week’s Cook, Blog, and Share event, run by Lucy of Supergolden Bakes. Line a 13-x-8-inch sheet pan with parchment paper. Grease and flour the paper and sides of the pan. Preheat the oven to 400°F/200°C. 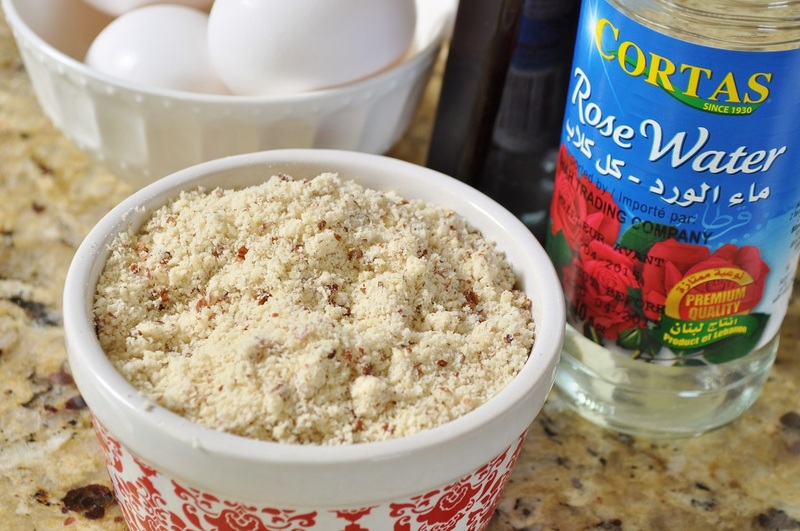 In a small bowl, sift together the flour and almond meal. Set aside. 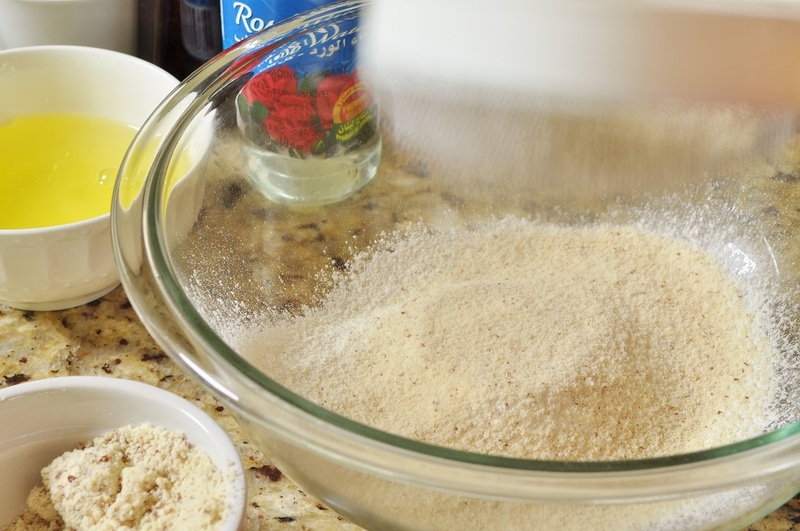 In the bowl of a stand mixer fitted with the whisk attachment, beat the egg yolks with ½ cup of the granulated sugar until the mixture is pale and thick, about 5 minutes. Beat in the vanilla and rosewater. Transfer to a large bowl and set aside. Thoroughly clean and dry the mixer bowl and whisk attachment. Now place the egg whites in the mixer bowl, and whip on high speed until they are foamy. With the machine running on high speed, gradually beat in the remaining ¼ cup of sugar, and continue to whip until the whites are glossy and hold soft peaks. 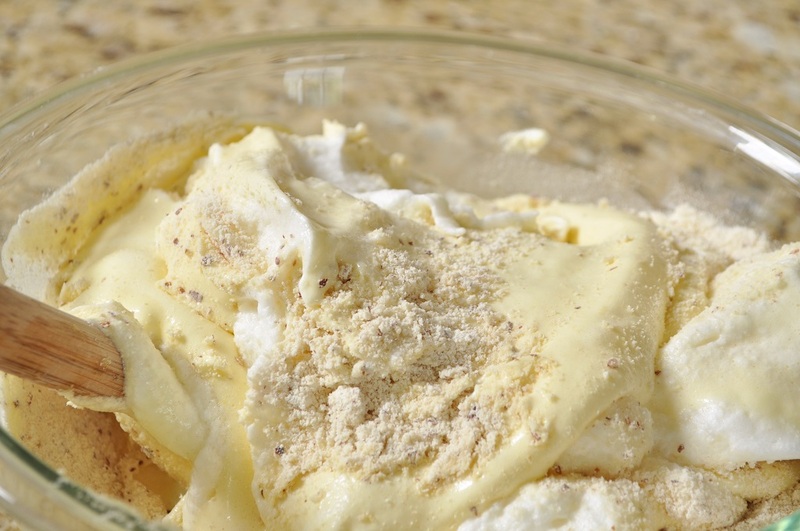 Using a rubber spatula, gently fold half of the meringue into the egg yolk mixture to lighten it. Add the remaining meringue and sifted dry ingredients; fold until no streaks remain. 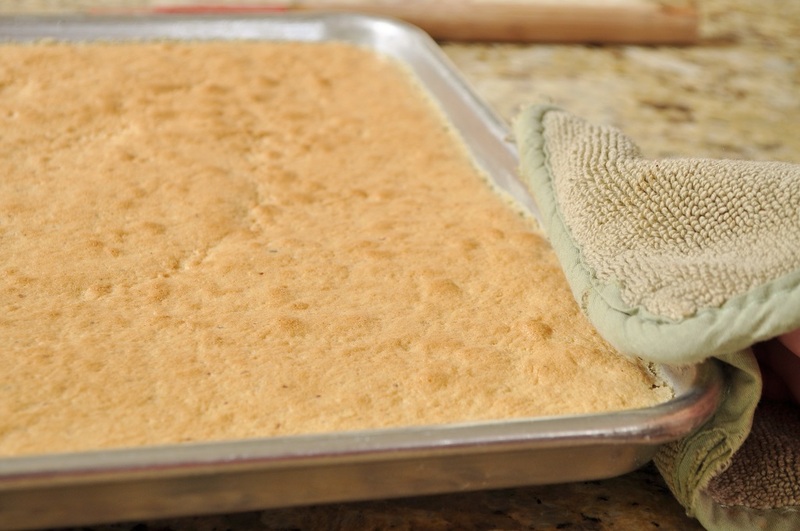 Use a long metal spatula to spread the cake batter evenly in the prepared sheet pan. Place in the oven. Bake until the cake is pulling away slightly from the sides of the pan and springs back when pressed with a finger, 10 to 13 minutes. Remove from the oven, run a knife around the edge of the pan to loosen the cake, and immediately slide it out of the pan onto a wire rack to cool. To prepare the buttercream, combine the granulated sugar and water in a small saucepan over high heat and bring to a boil. Add the corn syrup and continue to boil, without stirring, until the sugar syrup reaches the soft-ball stage, 238°F/115°C on a candy thermometer. 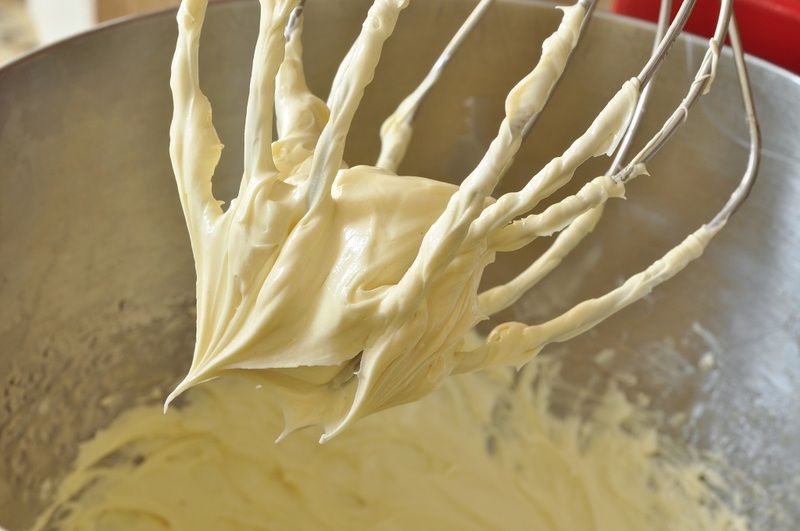 Place the egg yolks in a stand mixer fitted with the whisk attachment and whip them on high speed until they are slightly lightened in color and foamy. With the machine running, slowly pour the sugar syrup into the yolks in a steady stream. Continue to beat until the meringue has cooled to room temperature. 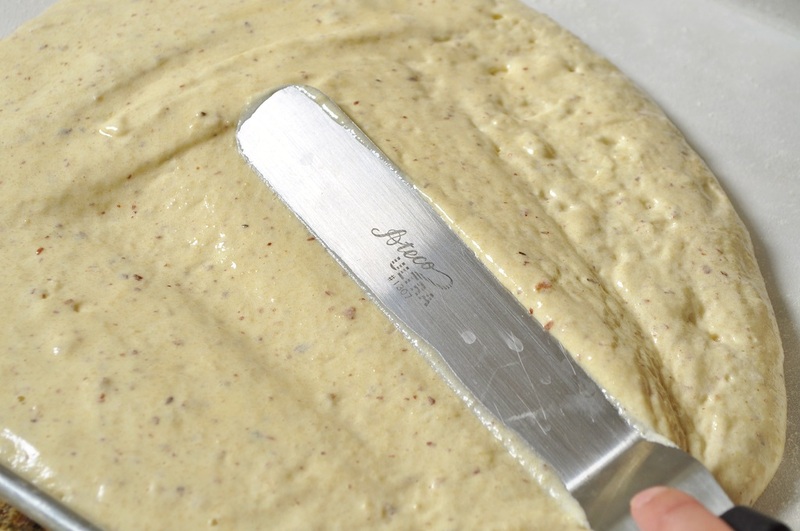 Decrease the speed of the mixer to medium and beat in the butter, adding a few pieces at a time. Turn the speed back to high and whip until the buttercream is light and smooth. Add rosewater to taste. Peel the parchment paper off the bottom of the almond sponge cake. 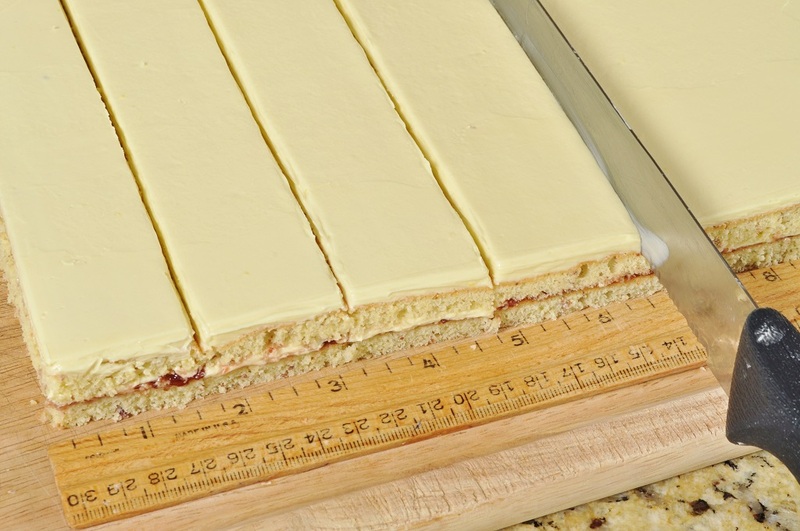 Cut the cake down the center widthwise to make two equal rectangles. 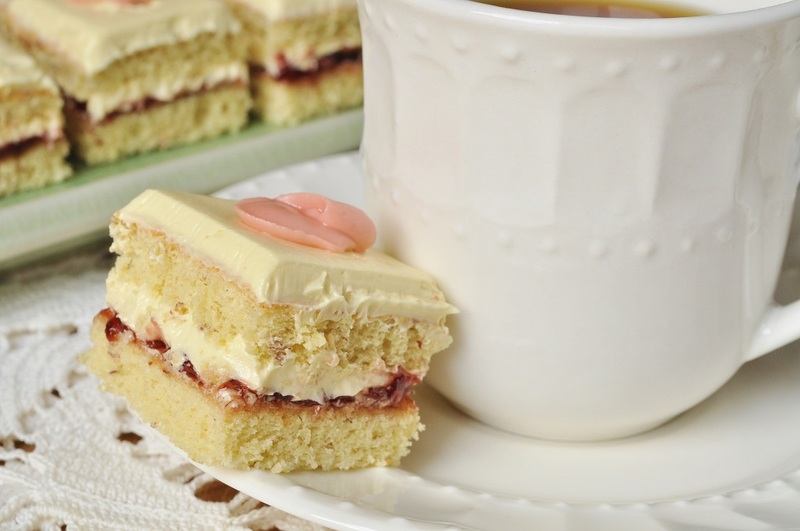 Place one of the pieces of sponge cake on a work surface lined with wax paper and spread a thin layer of raspberry jam over it. 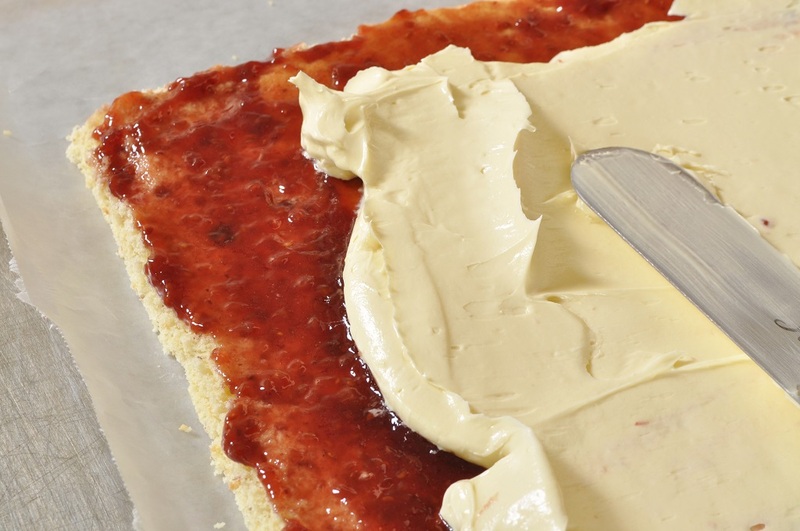 Take slightly less than half of the buttercream and spread it over the jam. 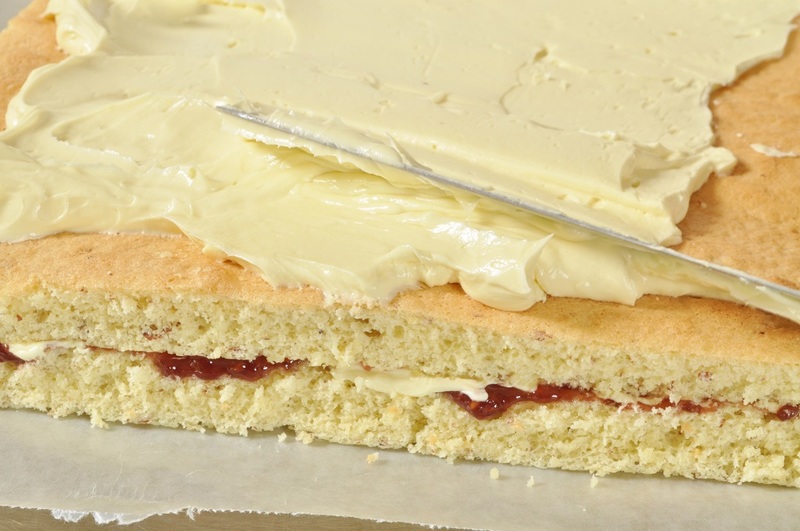 Top with the second rectangle of sponge cake and press down gently to secure the two layers together. Ice the top of the cake with the remaining buttercream. 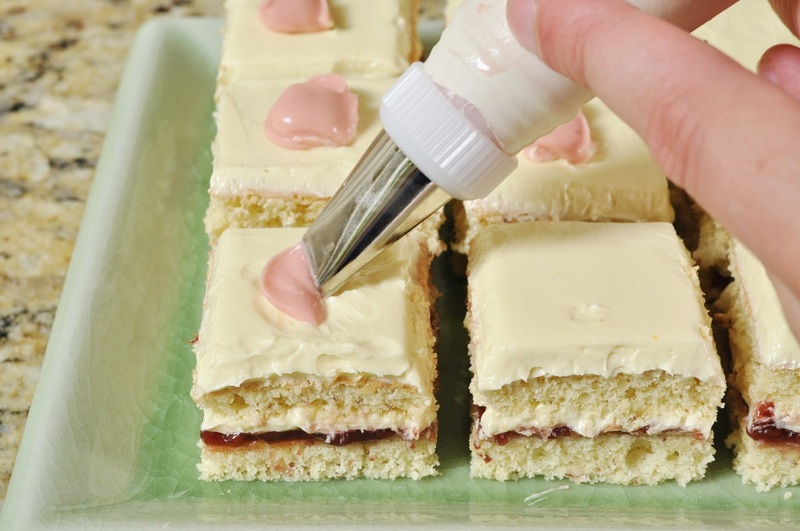 Slide the wax paper and the cake onto a baking sheet and place it in the refrigerator. 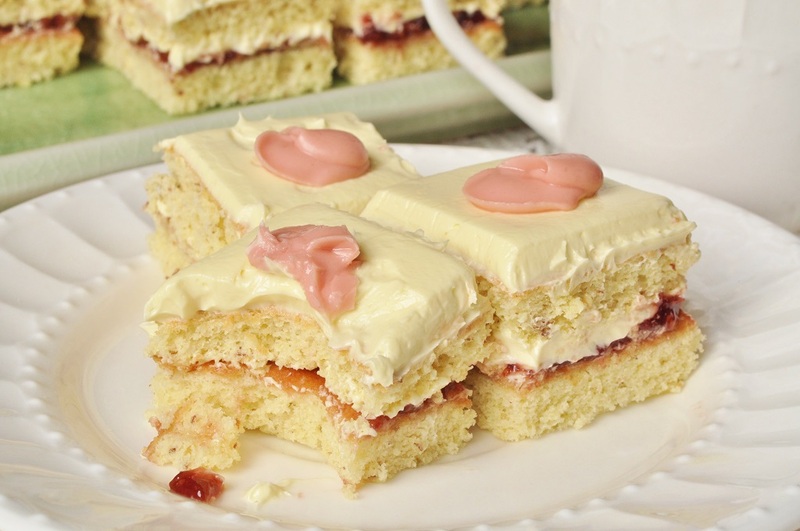 Once the buttercream has hardened slightly, take the cake out of the refrigerator and slide it onto a cutting board. 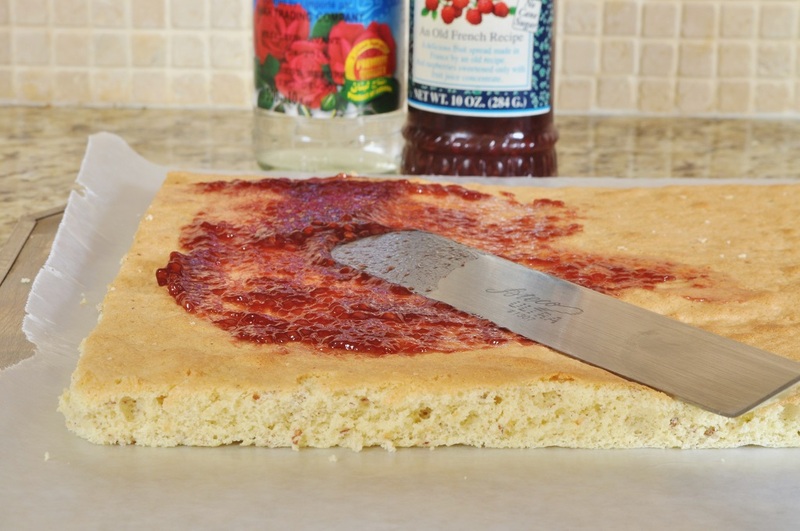 Use a long serrated knife to trim off any uneven edges, and then cut the cake into 1 ½-inch squares. 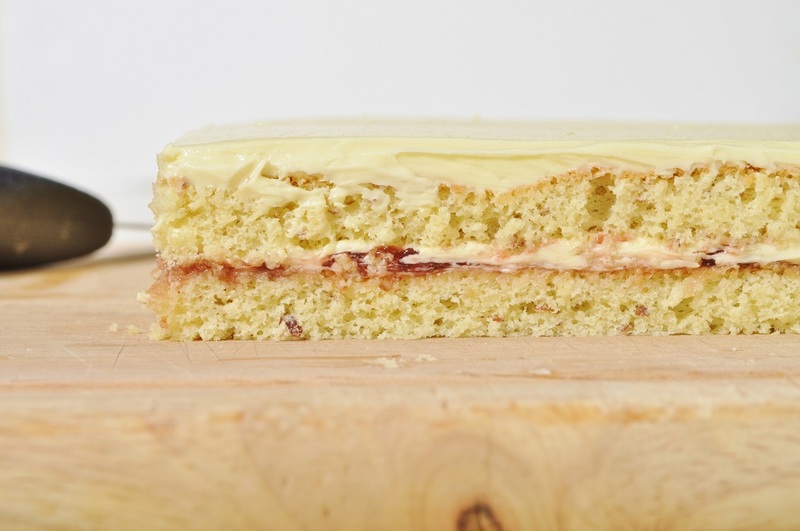 Wipe the blade of the knife off between cuts, so you don’t smear raspberry jam onto the top layer of buttercream. Fit a piping bag with a small (#101) petal tip and fill it with pink royal icing. Holding the bag at a 45° angle, with the wide end of the tip against the cake and the narrow end pointing to the 9 o’clock position, squeeze out the icing while rotating the tip clockwise, and let the icing fan out into a petal shape. Stop squeezing and pull the tip away. Now place the tip, still at a 45° angle, under the right-hand side of the first petal, with the wide end of the tip pointing towards you. Squeeze out the icing, which will catch the lip of the first petal and curl it over onto itself. Once the second petal is wide enough to cover the base of the first petal, relax the pressure and touch the tip back down to the surface of the cake. Stop squeezing completely and then lift the tip away. Repeat to decorate the remaining petit fours. Petit fours certainly are a bit fussy, and that’s actually why I like making. And these week I was just dying to do a “project” recipe, one that would keep me in the kitchen all afternoon. These petit fours did! These are so pretty to look at and sound gorgeous to eat! It’s brilliant that you’ve now found a way to use up at least some of those egg yolks and thank you for the piping tutorial! 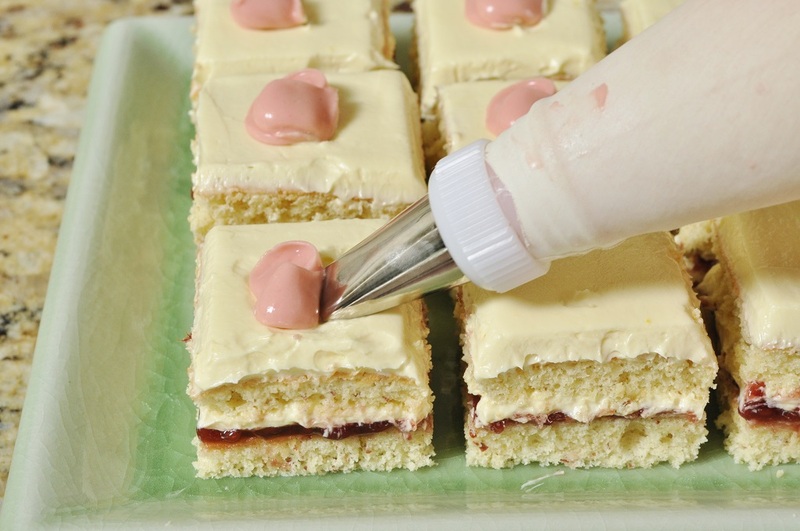 Oh, I’m so glad you found the instructions for piping the buttercream rosebuds helpful–I agonized over writing that part of the recipe, and it’s nice to know that my efforts were not in vain! These look so light and lovely. 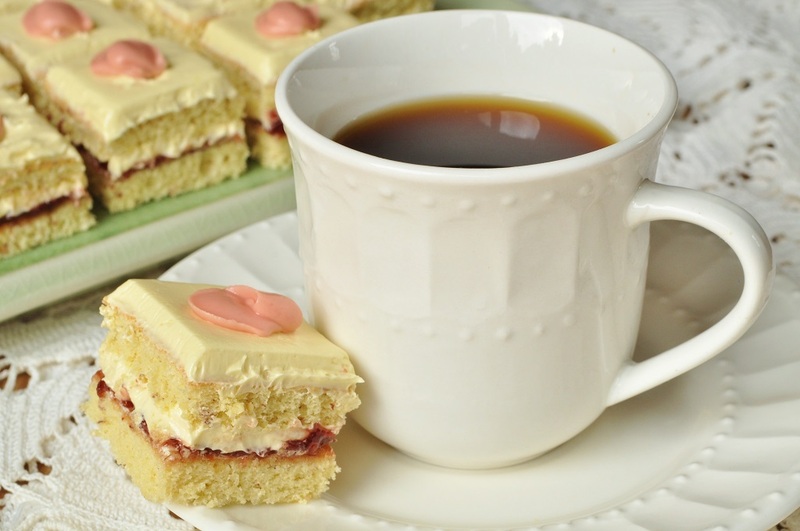 That buttercream looks really decadent and a great use for those egg yolks. Delicious! Thank you, Kate! Yes, it’s such a relief to find a recipe (and a delicious one to boot) that will help me get through all those surplus yolks. Everything you make is so incredibly gorgeous you talented person you! 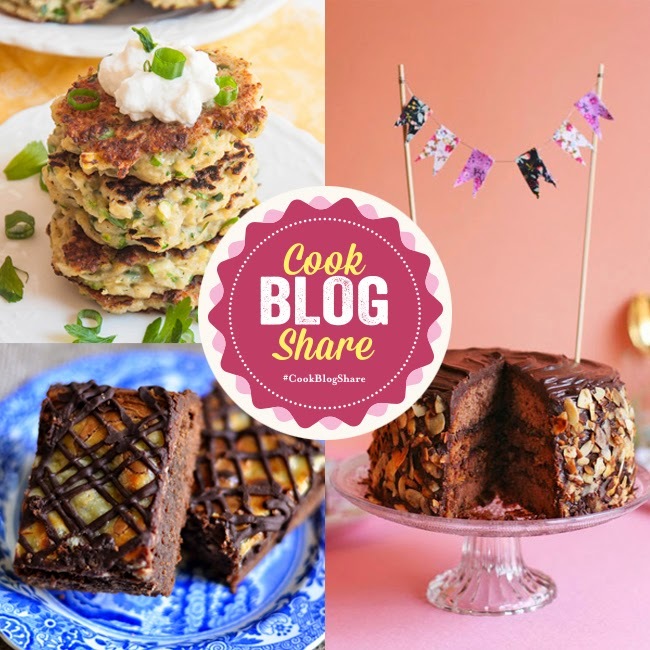 🙂 Thank you for linking up with Shop Local and the No Waste Food Challenge – these aer BEAUTIFUL!! And thank you, Elizabeth, for allowing all of us to share our talents through your lovely challenges! My pleasure, Michelle. I wonder that the tip about freezing egg yolks isn’t more widely known. When I think of all the eggs yolks I’ve wasted in the past . . . ugh. These look so perfect Alexandra, a really stunning bake, which I’m sure would have not gone amiss at the wedding. Raspberry and rose is a match made in heaven. I make my own rose syrup which I prefer to the bought rose water, but it never really hangs around that long as we usually end up drinking most of it. It does seem an awful shame about the egg yolks, but don’t really have any tips to give you. Couldn’t you get your family to change their ways and make their omelettes differently? Thank you, Choclette. 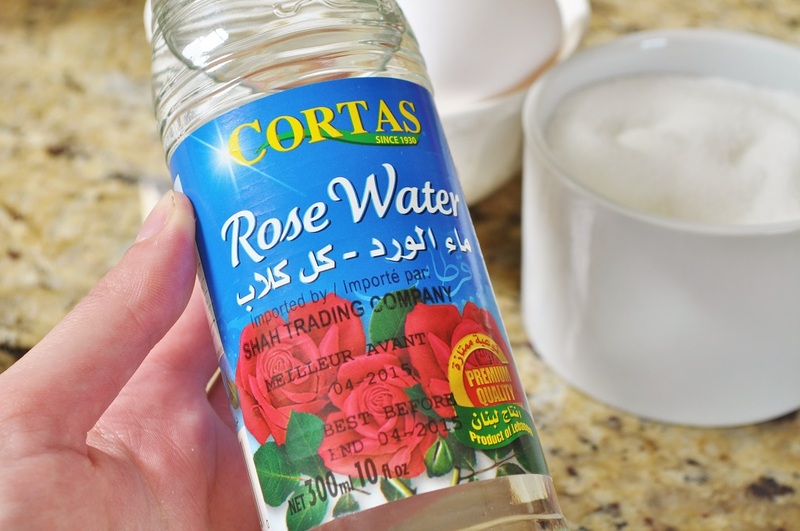 How do you make your rosewater? That sounds like it would be very interesting to try. As for the omelettes–you know how people can be about the way they like their eggs!